Fair Isle Bird Observatory: the Warden's diary: Early September update. The second Swinhoe's Petrel was retrapped again last night, when weather conditions were good for catching petrels. This was the first ringing session since the night of 16th/17th August, and was carried out following the guidelines from the BTO. Only Storm and Leach's Petrel tapes were used, at our usual site. After about an hour, and after catching 8 Storm Petrels, the Swinhoe's was caught. At that point, and again following the BTO's guidelines, trapping operations ceased - the tape was turned off and the net furled. The Swinhoe's Petrel was processed and released quickly; no photos were taken. As agreed with the BTO, we have contacted them to report the recapture, and we are now waiting for further guidance. 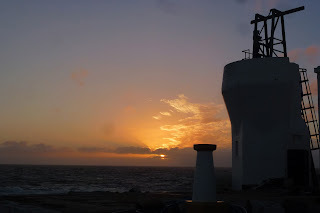 Until we have that there will unfortunately be no more petrel ringing sessions. Our third Citrine Wagtail of the year was found in strong westerly winds at Easter Lother Water on 31st (although it was probably heard at Wirvie the day before during a day of alba wagtail passage, when 107 were counted) and was still present to 2nd. Other highlights included the Thrush Nightingale, which relocated to Schoolton and remained to 30th, the Icterine Warbler which continued to show well at Stackhoull until 2nd, Corncrake sightings on 30th and 31st and a Common Rosefinch still on 29th. With the weather conditions over the last few days generally rather unpleasant, other than a brief break yesterday evening, there have not been a lot of new arrivals with most passerine migrants being lingering birds (including over 600 Meadow Pipits, although some southerly passage of this species was still being observed). Some new things did sneak through, with 7 Crossbill (30th), a Sedge Warbler and Woodpigeon (both 30th), whilst Tree Pipits peaked at 6 on 29th when there were also 29 Swallows. The westerly gales brought another fresh pulse of waders and wildfowl to the island with the undoubted highlight being the three Pintail that flew east past South Light amongst a small group of Wigeon on 1st. Although an annual visitor to Fair Isle in very small numbers, these were the first I’d managed to connect with, so it was well worth spending 90 minutes in the back of the Transit (the preferred seawatching location when it’s raining so hard you could drown standing up) with Richard! Other counts included up to 45 Teal, 33 Wigeon and 4 Greylag, with a Tufted Duck seen on 1st. Seawatching was otherwise fairly quiet, although there were 3 Sooty Shearwater on 31st, 5 Storm Petrels seen from the Good Shepherd on 29th (with a rare diurnal land-based sighting from Buness on 31st) and a ‘blue’ Fulmar on 29th. There were also small numbers of Kittiwakes offshore, along with 3 Arctic Terns (1st) and another arrival of Lesser Black-backed Gulls to the island, peaking at 47 on 1st. There were no rare waders discovered (yet), but counts included up to 5 Black-tailed Godwit, 4 Ruff, 45 Golden Plover and singles of Knot, Greenshank and Whimbrel. There was also a peak of 8 Grey Heron (30th). One of the most impressive sights of the period was a day of multiple cetacean sightings on 30th. The initial call of ‘dolphins, distantly off Buness’ got people running out the Obs and the speed picked up a bit when 5 magnificent Killer Whales, including three huge bulls, surfaced a bit further out (it was especially pleasing for those visitors whose plane was delayed and were therefore able to see these special cetaceans, rather than just flying over Buness on their way home wondering what the crowd was looking at). 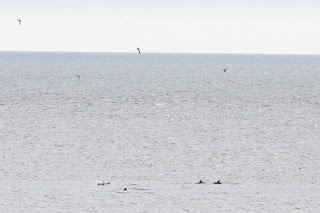 The dolphins came closer and revealed themselves to be 40 White-beaked Dolphins and by the end of the day, there were another 2 White-beaked Dolphins seen, along with Minke Whale and 4 Porpoise. Causing a splash. 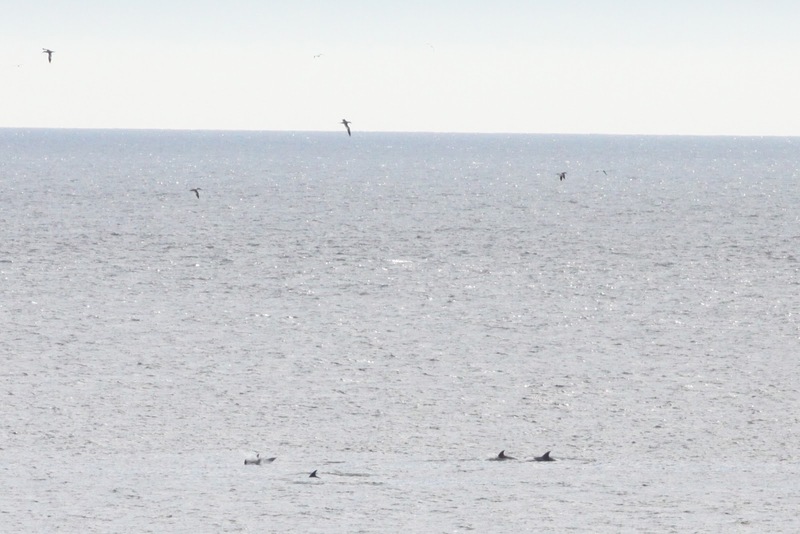 Some of the White-beaked Dolphins hunting off Buness.